The 2003 National League Championship Series coincided with the weeklong Jewish festival of Sukkot. 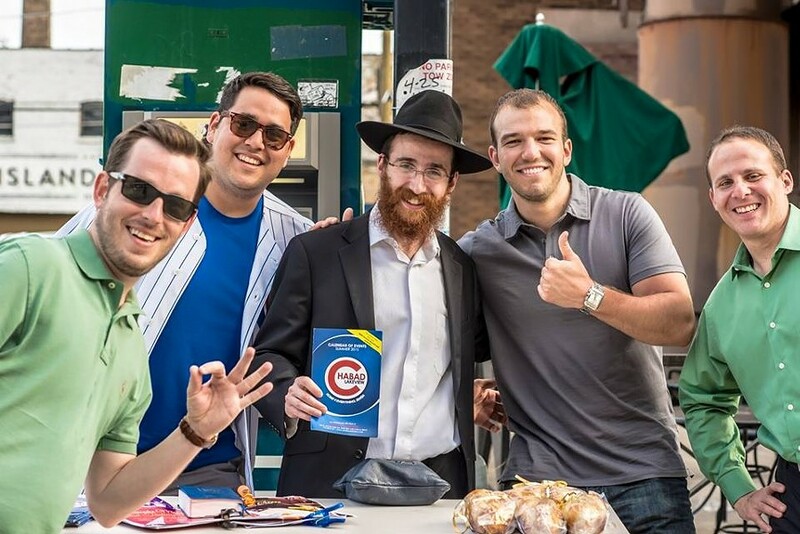 During that week, Rabbi Boruch Hertz, an emissary of the Lubavitch Chabad, built a sukkah across the street from Wrigley Field and encouraged everyone, but especially Jews, to come in and pray with him. Rabbi Dovid Kotlarsky, Hertz's son-in-law, took up the mantle of the Rebbe of Wrigleyville at the beginning of last season, when he moved to Chicago from Brooklyn. He's a slender young man with a red beard and a hoarse voice. 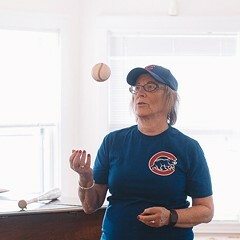 He set up a table across Addison Street from the ballpark and encouraged Jewish Cubs fans to recite blessings with him. Sometimes he wears his long black coat and and round black hat, but he also had a silver jersey printed up that reads "Team Chabad" on the front and "Rabbi Dovid" on the back. The move did not upset any existing loyalties, he said, since he always preferred playing baseball to watching. (This is also an easy to way to disavow any claim that his divided loyalties were responsible for the Cubs' collapse against the Mets last year.) He has developed a fondness for the Cubs, however, and admires their persistence. 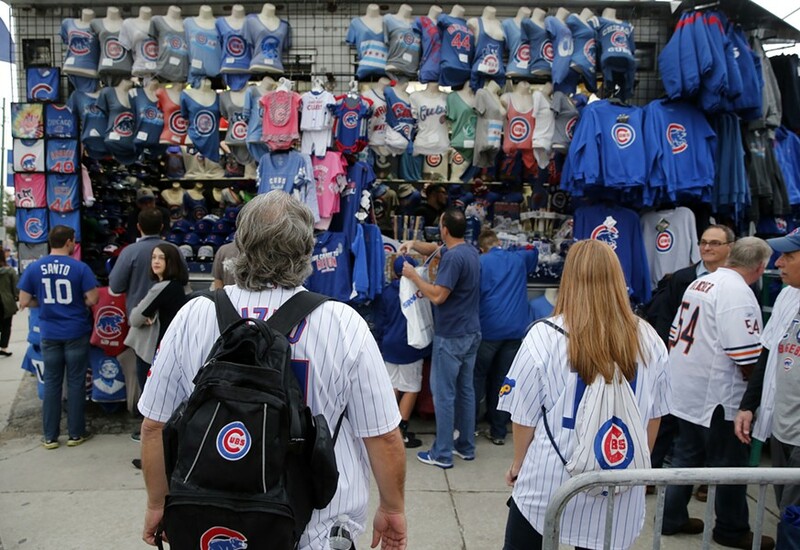 Fans look at Cubs merch outside Wrigley Field before game two of the NLCS. On Sunday afternoon, during the last few hours before sundown and the beginning of Sukkot, he made his rounds outside the ballpark. He had just finished and was ready to dash up to West Rogers Park by the time we finally found each other, but he said it had been a successful day and he had guided many people through the basic Jewish blessings. "Everyone's in a holiday mode," he reported. "It's a good atmosphere." There are no specific prayers in the Jewish liturgy for victory in sporting events. Nor will Kotlarsky say a prayer to vanquish one's enemies. "We want to focus on the positive," he explained. "Jews believe that blessings and prayer are between you and God." After the Sh'ma, however, the prayer during which Jews affirm their belief in a single God, there is a brief moment when the person praying can ask God to fulfill a personal need. 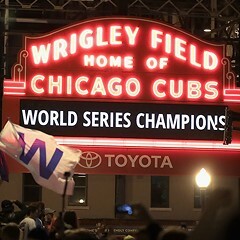 "For many people," Kotlarsky said, "the Cubs are personal, and they want to pray for the Cubs' success. So before you say 'Amen,' you can insert a short 'Go Cubs, God bless the Cubs.' 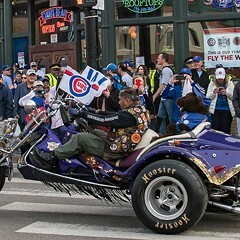 "
Though the Cubs will be playing in LA for the rest of the week and Sukkot, Kotlarsky intends to follow in the tradition of his father-in-law and bring a sukkah to Wrigleyville. His will be mounted on the back of a truck and he plans to drive it through the neighborhood and invite everyone to come aboard and wave the lulag and etrog. 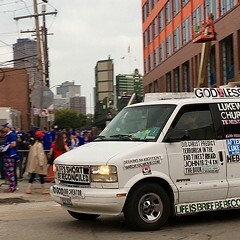 He was coy, though, about whether he believes God actually favors the Cubs. "The Cubs are bringing the whole city together," he said. "God is definitely a fan of people doing good things and being happy." As the All-Star break approaches, the team is currently the best in baseball. But for a diehard fan of nearly 60 years, a Cubs World Series wouldn’t change a thing. Rabbi Byron Sherwin knows how to lift the Cubs' curse. But don't ask him to do it.